How’d the Sauerkraut Come Out? | ReLocavore: Redefining "local"
How’d the Sauerkraut Come Out? A few weeks ago, I started the Sauerkraut – or the salted, shredded cababbage as it was known back then… Now it’s matured into full-fledged sauerkraut. And it tastes like sauerkraut. It has a little bit more character than store-bought kraut, especially because it has less salt and because I haven’t applied any heat to kill off the culture. Otherwise, it’s mostly interchangable with the store-bought product. 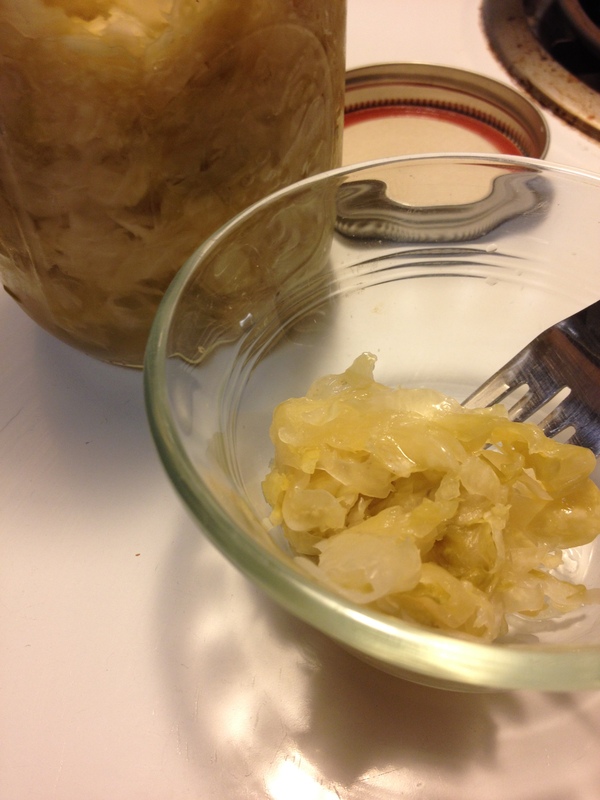 In total, we had 4 pounds of cabbage and that became 1 quart and 1 pint of finished kraut. (6 cups for the non-canning inclined). That’s just enough for a batch of Cabbage Rolls and one dinner of kielbasa, mashed potatoes, and sauerkraut. Categories: Farms and Markets, Putting Food By | Tags: cabbage, ferment, german food, kraut, sauerkraut | Permalink. I have 4 heads of red cabbage. I purchased them thinking they were the normal kind. I’m going to try a batch of cabbage rolls with red cabbage. Should be a lovely color. Cole slaw will be kind of odd but I’m doing it. Let me know if you find other recipes. Mu shu pork might be okay. I guess we eat the stuff in the dark. I was also going to make a big jar of sweet and sour cabbage – basically red cabbage, apples, pickling spice and vinegar.